This Hawaiian poke (pronounced poke-ay) recipe combines sashimi-grade ahi tuna with a bright citrus and ginger marinade. Cut tuna into 1/2-inch cubes and place in a large bowl. Add the onions, scallions, coconut aminos, sesame oil, lemon and grapefruit juice, red pepper flakes, and ginger powder and toss gently. Cover and place in refrigerator 30 minutes. Meanwhile, cut avocado into cubes and segment grapefruit. When ready to serve, toss tuna mixture with avocado. 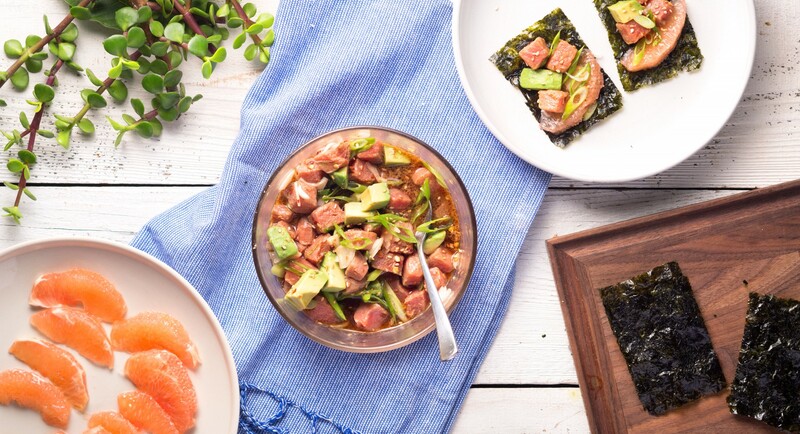 To serve, spoon tuna poke into roasted seaweed slices along with grapefruit.